This classic style is durable and comfortable with a sewn in front crease which adds to the profe..
65% Polyester 35% Cotton Fabric: 245 GSM/7 oz Flat front with sewn-in front crease Two Fron..
65% Polyester 35% Cotton Fabric: 245 GSM/7 oz Flat front with sewn-in front crease 2 side &..
65% Polyester 35% Cotton Fabric: 245 GSM/ 7oz Flat front with sewn-in front crease 2 side &.. Contemporary designed trousers Expandable waistband for comfortable fit The soft Polycotton t..
65% Polyester 35% Cotton Fabric: 245 GSM/7 oz Flat front with sewn-in front crease Four Sla..
65% polyester/35% cotton canvas. Stain resistant Teflon coating. Internal knee pad pockets. ..
A long sleeve t-shirt cut that offers optimum warmth at all times. 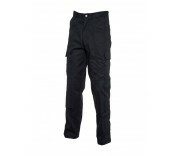 The material construction allows ..
B121 Thermal Trouser The B121 creates a layer of warmth around the lower body. The soft poly-cotton..